On the eve of Abraham Lincoln's birthday, Henry Louis Gates, Jr. appeared on NBC's "The Today Show" to talk about LOOKING FOR LINCOLN, Lincoln's role in the end of slavery, and the president's continuing impact on America. Listen now to LOOKING FOR LINCOLN presenter and writer Dr. Henry Louis Gates, Jr. on "The Tom Joyner Morning Show". LOOKING FOR LINCOLN presenter and writer Henry Louis Gates, Jr. appeared on Comedy Central's "The Colbert Report" to talk about the documentary and his new book, Lincoln on Race & Slavery. 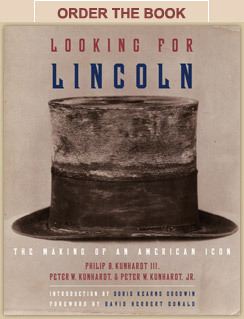 LOOKING FOR LINCOLN, presented and written by Harvard professor Henry Louis Gates, Jr., addresses many of the controversies surrounding Abraham Lincoln – race, equality, religion, politics, and depression – by carefully interpreting evidence from those who knew him and those who study him today. Lincoln’s Legacy: A Conversation with Henry Louis Gates, Jr.
Henry Louis Gates, Jr., the presenter and writer of LOOKING FOR LINCOLN, spoke with THIRTEEN about Abraham Lincoln's impressive legacy. Read the interview now.